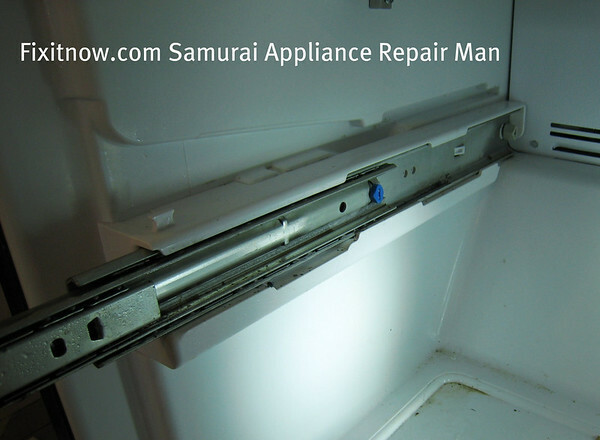 So here’s the photo odyssey you’ve been waiting for: replacing the freezer door rail slides in an Amana-built, bottom-mount refrigerator. Some things that may necessitate you doing this job would include the rails making the door hard to open or keeping it from closing reliably. Here, I’m showing you the old rail so you can see how it’s installed. Notice in particular that there’s a little plastic catch in the back; click the thumbnail and you’ll see a larger view where the catch will be annotated with a note. You need to depress the catch in order to release the slide rail and it slides right out. In this next photo, I’m showing a slide rail holster and its retaining screws that you can remove in case you do need to remove or replace the holsters. Generally, you don’t need to replace the holsters unless they’re cracked or damaged. They’re just cheap plastic and they will break on occasion but this is rare. Most of the time, you’ll just be replacing the slide rails. Okay, moving on. In this next photo, I’m just showing you a comparison between the old sliding rails and the upgraded slide rails. 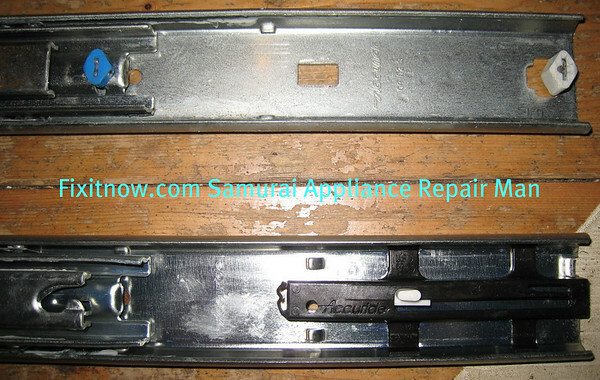 These slide rails have been upgraded to a include a catch mechanism that will catch the door in the last couple inches of closure and help pull it all the way closed. 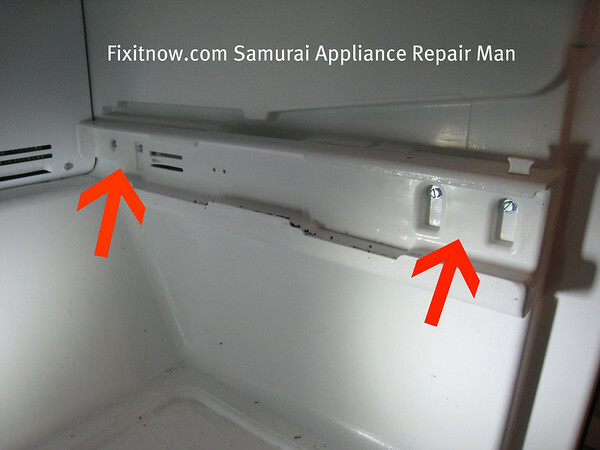 There were lots of complaints of the freezer door not closing reliably so they added a spring-assist closing mechanism to the upgraded slide rails to help fix that. Here I’m just showing a close-up of the closure mechanism that’s been added to the new rail assembly. 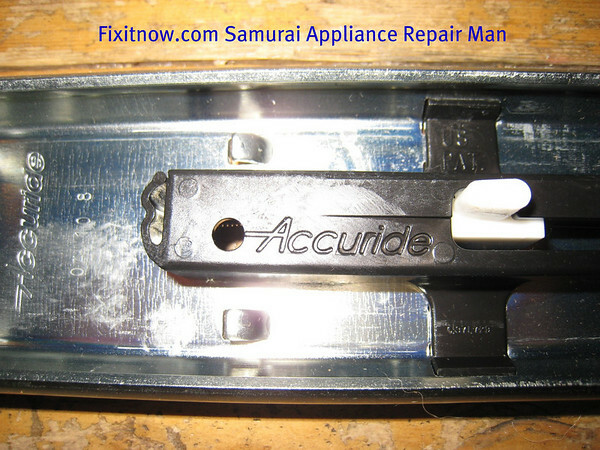 And finally, I’m revealing the trick for how to remove the slide rails on the upgraded rail assembly. 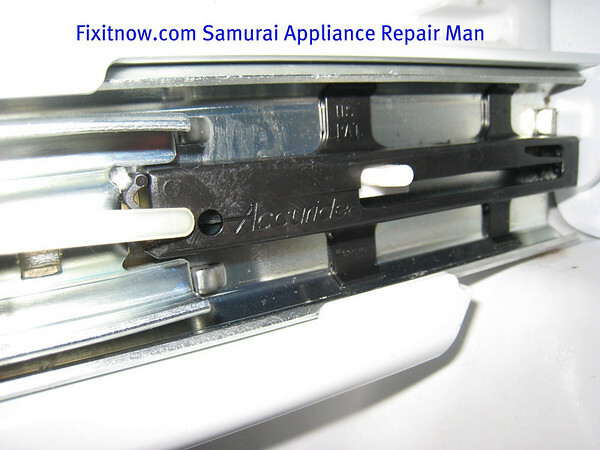 The door-assist closure assembly covers the access hole to depress and release the slide rail from the holster. So they drilled this little access hole that you can stick a small screwdriver through to depress the plastic catch and release the slide rail. Ain’t that sweet? And, to make your joy complete, here’s the part link for the slide rails. They’re ambidextrous so the same part works on the right and left side. But you should always change ’em as a pair. 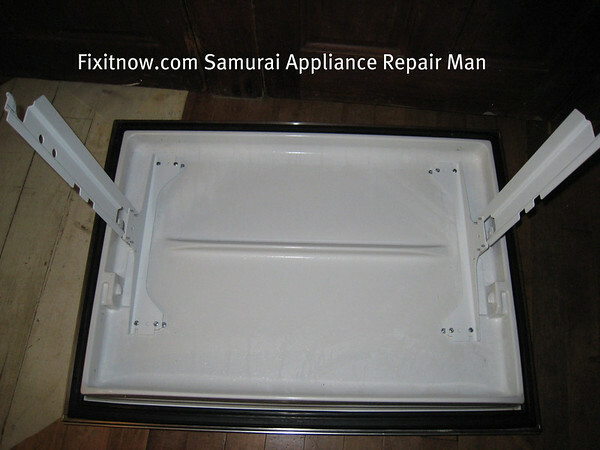 This entry was posted in Refrigerator Repair on September 19, 2010 by Samurai Appliance Repair Man.